Everyone loves peonies right? Well, after our brilliant coral peonies at the Mother’s Day Sale, our customers were asking if we would have more peonies available soon. Rather than waiting until our June Flower Sale, which wasn’t until the end of the month, we decided to offer a weekly peony subscription for our clients. We offered a wrap containing seven peonies, plus foraged greenery and some filler flowers, and we provided delivery to home or office every Wednesday for 4 weeks. We utilized all USA grown peonies from Oregon to Iowa over the course of the peony season. It was a fun way to follow the progression of peony season from the earliest west coast offerings around Mother’s Day all the way into the middle of June. I hope everyone enjoyed their weekly peony delivery! 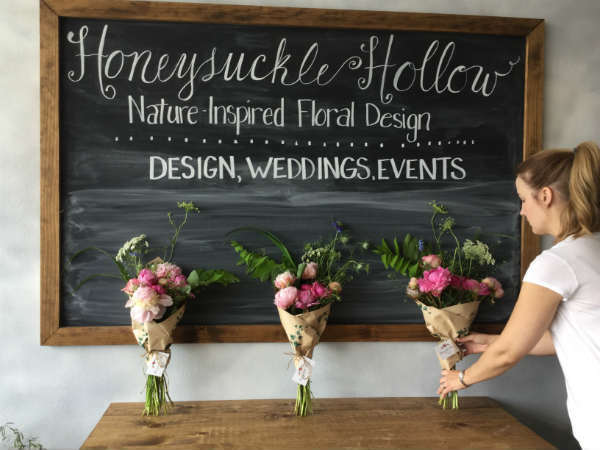 At Honeysuckle Hollow, we strive to be creative not only in our floral design but also in the way we bring flowers to people. Many flower growers offer subscriptions in this country where they provide a weekly wrap of flowers for their customers throughout the growing season, which is where I got the idea. I decided that I could use my flower connections in the USA to find farm direct product, spice it up with some fun, foraged, wild goodies and bring them right to your doorstep for a very affordable price. Setting out into my pastures and woods each week for the wild filler and greenery was half the fun. It was amazing to see how things changed from week to week as I set out in search of unique goodies to pair with the peonies. Some weeks I supplemented my foraged items with special filler flowers and greens from local flower growers. One such item was the gorgeous foxgloves that were included in the final delivery (Week #4) that came from Alissa’s Flowers north of Sioux Center. Another week I included some blooms from Harvest Home Flowers in Waverly, Iowa. Sometimes I included something leftover from the wedding flowers that week. I hope everyone enjoyed the unique pairings!